St. John Kanty Church - Buffalo, NY > News > Events > Have a Few Hours to Spare? Our small gardening committee of three parishioners has already been busy with some grounds and garden cleanup, as well as planting the bulbs that decorated our church at Easter and also colorful annuals. When the planting is done, garden and grounds maintenance takes over. It takes a few hours a week on a regular basis to maintain a welcoming appearance as well as set a good example for the neighborhood. If you have a couple of hours to spare, either on a Wednesday or a Saturday morning (weather permitting), you are welcome to spend a few hours with us caring for your church and grounds…there is always something to do, and many hands make light work! Easter Lilies are Available for Your Garden! The church looked beautiful this Easter, and now…if you would like to have a lily or two for your home garden, they are available following this weekend’s Masses. If planted now (sunny location preferred) they will bloom again not only this Fall but for years to come. They will ‘wake up’ in the early Spring and remind you of the cherished tradition of the Easter lily: Often called the “white-robed apostles of hope,” lilies were found growing in the Garden of Gethsemane after Christ’s agony. Tradition has it that the beautiful white lilies sprung up where drops of Christ’s sweat fell to the ground in his final hours of sorrow and deep distress. 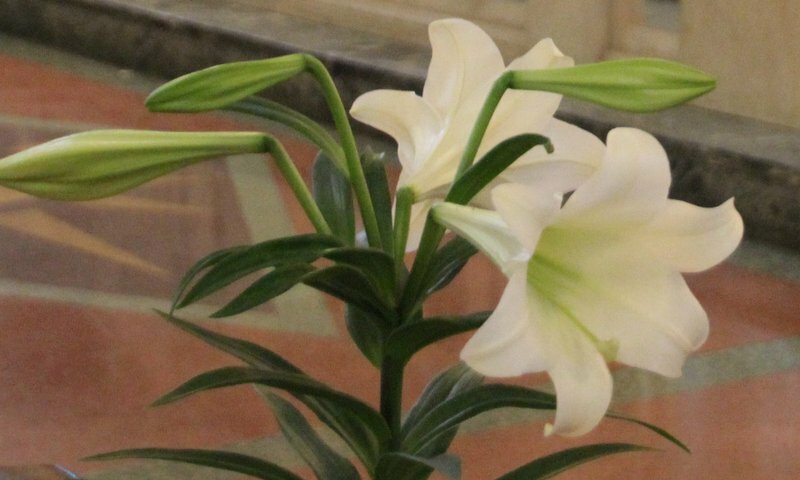 Churches continue this tradition at Easter time by banking their alters and surrounding their crosses with masses of Easter lilies, to commemorate the resurrection of Jesus Christ and hope of life everlasting. Please see Judy at the parking lot entrance if interested.